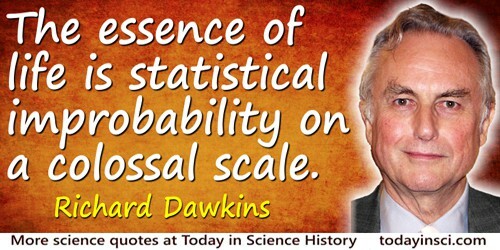 English evolutionary biologist and science writer known for his outspoken opinions as an atheist on creationism. 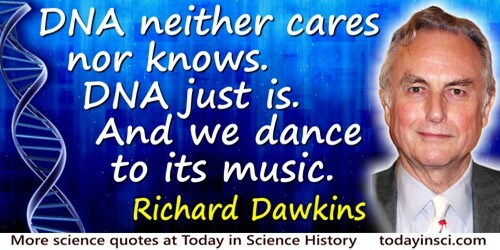 He wrote the best-selling The Selfish Gene, his reformulation of the theory of natural selection. '[R]eductionism' is one of those things, like sin, that is only mentioned by people who are against it. To call oneself a reductionist will sound, in some circles, a bit like admitting to eating babies. But, just as nobody actually eats babies, so nobody is really a reductionist in any sense worth being against. The Blind Watchmaker (1996), 13. All appearances to the contrary, the only watchmaker in nature is the blind forces of physics, albeit deployed in very special way. A true watchmaker has foresight: he designs his cogs springs, and plans their interconnections, with a future purpose in his mind's eye. Natural selection, the blind, unconscious, automatic process which Darwin discovered, and which we now know is the explanation for the existence and apparently purposeful form of all life, has no purpose in mind. It has no mind and no mind's eye. It does not plan for the future. It has no vision, no foresight, no sight at all. If it can be said to play the role of watchmaker in nature, it is the blind watchmaker. The Blind Watchmaker (1986), 5. In The God Delusion (2007), 321. As cited in John C. Weaver and John David Weaver, Christianity and Science (1973, 1984), 22. Cheetah genes cooperate with cheetah genes but not with camel genes, and vice versa. This is not because cheetah genes, even in the most poetic sense, see any virtue in the preservation of the cheetah species. They are not working to save the cheetah from extinction like some molecular World Wildlife Fund. From Unweaving the Rainbow: Science, Delusion, and the Appetite for Wonder (1998), 218. River Out of Eden: A Darwinian View of Life(1995), 133. If you don’t know anything about computers, just remember that they are machines that do exactly what you tell them but often surprise you in the result. The Blind Watchmaker (1996), 51. Intelligent life on a planet comes of age when it first works out the reason for its own existence. The Selfish Gene (1976), 1. It is grindingly, creakingly, crashingly obvious that, if Darwinism were really a theory of chance, it couldn’t work. You don't need to be a mathematician or physicist to calculate that an eye or a haemoglobin molecule would take from here to infinity to self-assemble by sheer higgledy-piggledy luck. Far from being a difficulty peculiar to Darwinism, the astronomic improbability of eyes and knees, enzymes and elbow joints and all the other living wonders is precisely the problem that any theory of life must solve, and that Darwinism uniquely does solve. It solves it by breaking the improbability up into small, manageable parts, smearing out the luck needed, going round the back of Mount Improbable and crawling up the gentle slopes, inch by million-year inch. Only God would essay the mad task of leaping up the precipice in a single bound. In Climbing Mount Improbable (1996), 67-8. It is raining DNA outside. On the bank of the Oxford canal at the bottom of my garden is a large willow tree, and it is pumping downy seeds into the air. ... [spreading] DNA whose coded characters spell out specific instructions for building willow trees that will shed a new generation of downy seeds. … It is raining instructions out there; it’s raining programs; it’s raining tree-growing, fluff-spreading, algorithms. That is not a metaphor, it is the plain truth. It couldn’t be any plainer if it were raining floppy discs. The Blind Watchmaker (1986), 111. River Out of Eden: A Darwinian View of Life (1995), 112. Part of the appeal was that Medawar was not only a Nobel Laureate, but he seemed like a Nobel Laureate; he was everything one thought a Nobel Laureate ought to be. If you have ever wondered why scientists like Popper, try Medawar's exposition. Actually most Popperian scientists have probably never tried reading anything but Medawar's exposition. 'The Art of the Developable', New York Review of Books (Oct 1983). The first two sentences, slightly edited, were reprinted in A Devil's Chaplain (2004), 196. Reductionism is a dirty word, and a kind of 'holistier than thou' self-righteousness has become fashionable. The Extended Phenotype: The Gene as the Selection (1982), 113. Religion shows a pattern of heredity which I think is similar to genetic heredity. ... There are hundreds of different religious sects, and every religious person is loyal to just one of these. ... The overwhelming majority just happen to choose the one their parents belonged to. Not the sect that has the best evidence in its favour, the best miracles, the best moral code, the best cathedral, the best stained-glass, the best music when it comes to choosing from the smorgasbord of available religions, their potential virtues seem to count for nothing compared to the matter of heredity. From edited version of a speech, at the Edinburgh International Science Festival (15 Apr 1992), as reprinted from the Independent newspaper in Alec Fisher, The Logic of Real Arguments (2004), 82-83. Religious people split into three main groups when faced with science. I shall label them the ‘know-nothings’, the ‘know-alls’, and the ‘no-contests’. Scientific rationalism is the crowning glory of the human spirit. In The Blind Watchmaker: Why the Evidence of Evolution Reveals a Universe Without Design (1986), 317. The more you understand the significance of evolution, the more you are pushed away from the agnostic position and towards atheism. Complex, statistically improbable things are by their nature more difficult to explain than simple, statistically probable things. From edited version of a speech, at the Edinburgh International Science Festival (15 Apr 1992), as reprinted from the Independent newspaper in Alec Fisher, The Logic of Real Arguments (2004), 84. The physicist’s problem is the problem of ultimate origins and ultimate natural laws. 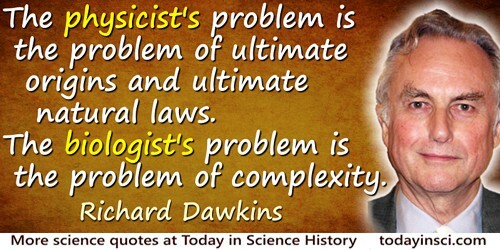 The biologist's problem is the problem of complexity. In The Blind Watchmaker (1996), 15. The present lack of a definitely acceptable account of the origin of life should certainly not be taken as a stumbling block for the whole Darwinian world view. In The Blind Watchmaker (1991), 166. We animals are the most complicated things in the known universe. The Blind Watchmaker (1986), 1. We are going to die, and that makes us the lucky ones. Most people are never going to die because they are never going to be born. The potential people who could have been here in my place but who will in fact never see the light of day outnumber the sand grains of Arabia. Certainly those unborn ghosts include greater poets than Keats, scientists greater than Newton. We know this because the set of possible people allowed by our DNA so massively outnumbers the set of actual people. In the teeth of these stupefying odds it is you and I, in our ordinariness, that are here. Unweaving the Rainbow (1998), 1. We are machines built by DNA whose purpose is to make more copies of the same DNA. ... This is exactly what we are for. We are machines for propagating DNA, and the propagation of DNA is a self-sustaining process. It is every living object's sole reason for living. Royal Institution Christmas Lecture, 'The Ultraviolet Garden', (No. 4, 1991). Quoted in Vinoth Ramachandra, Subverting Global Myths: Theology and the Public Issues Shaping our World (2008), 187. 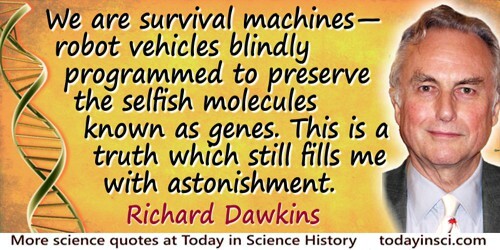 We are survival machines—robot vehicles blindly programmed to preserve the selfish molecules known as genes. This is a truth which still fills me with astonishment. From Preface to The Selfish Gene (1976, 2006), xxi. [O]ur own existence once presented the greatest of all mysteries, but … it is a mystery no longer because it is solved. Darwin and Wallace solved it … I was surprised that so many people seemed not only unaware of the elegant and beautiful solution to this deepest of problems but, incredibly, in many cases actually unaware that there was a problem in the first place! The Blind Watchmaker (1996), front matter. [Richard Leakey is] a robust hero of a man, who actually lives up to the cliché, “a big man in every sense of the word.” Like other big men he is loved by many, feared by some, and not over-preoccupied with the judgments of any. The Oxford Book of Modern Science Writing (2008), 190. 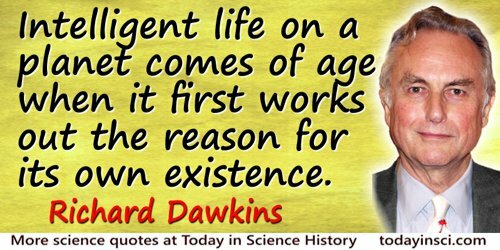 26 Mar - short biography, births, deaths and events on date of Dawkins's birth. 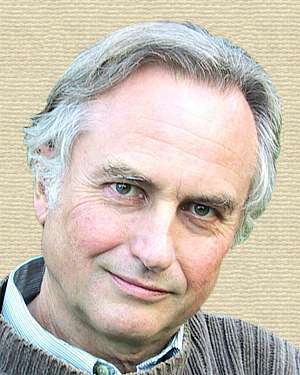 The Selfish Gene: 30th Anniversary Edition, by Richard Dawkins. - book suggestion.